Pining for the cubicle? Believe it. 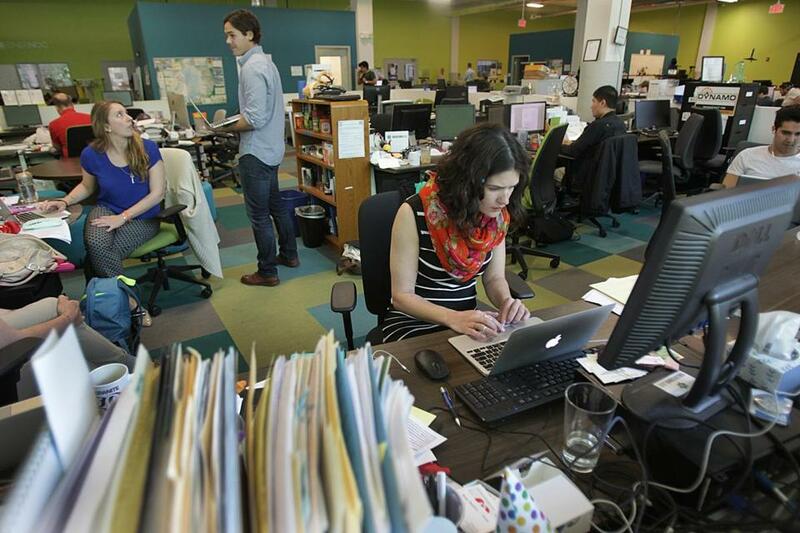 Micaelah Morrill worked at her desk at Greentown Labs in Somerville. To mangle Robert Frost’s line about good neighbors, do good cubicles make good co-workers? Partitioned offices have long been reviled as symbols of soulless, one-size-fits-all corporate America. They’re the places where Dilbert Nation works. But a funny thing is happening as cubicles disappear from the workplace: People are longing for a space to call their own — even a small, drab one with fabric walls. Now Aquillano, like a growing number of employees nationwide, works in an open office with no place to hide from distractions. Focusing is difficult when you can see your colleagues’ every move and hear their every conversation, said Aquillano, who runs the nonprofit Design Museum Foundation out of a co-working space in Boston, sometimes crouching in a corner when he’s on the phone so he doesn’t bother anyone. “My dream is I can push a button and the cone of the silence just falls on me,” he said. Wireless technology gives people the freedom to work from anywhere and millennials are accustomed to sharing everything, the reasoning goes, so some businesses are abandoning assigned desks altogether. Employees put their coats and purses in lockers, store papers in mobile filing cabinets, display family photos on their iPhones — and grab the first empty seat they can find. But there has been a major pushback. In many cases, architects and designers agree that the movement has gone too far, hurting productivity as well as morale. Boston area workers describe their company’s open plan as “overwhelming,” “exhausting,” and “part brave new world, part overstimulation, and part overcrowded ‘Brady Bunch’ bathroom on a school day morning.” An employee at a local software firm went so far as to fashion a homemade cubicle with posterboard around his new low-walled workspace. “The enemy you know,” he said. To keep collaboration from sliding into chaos, a few dividers are going back up, not around individual workers, but around small groups working as a team. There is a new emphasis on creating different types of work areas: phone booths for calls, screened-off desks, and designated quiet areas for tasks that involve concentration. These “moments of cubicle-ness,” as Paul Rosenberg puts it, helped smooth the transition to an open floor plan — with unassigned desks — in the Boston office he runs for the nonprofit consultancy Bridgespan Group. A little privacy can go a long way, it turns out. At a factory in China, teams with curtains around them were 10 to 15 percent more productive than those out in the open because they felt more comfortable experimenting and taking risks, said Ethan Bernstein, a Harvard Business School professor who conducted the research in China. Bernstein also found that at a corporate headquarters that moved from cubicles to an open layout, face-to-face communication declined by 70 percent and e-mail increased in its place — possibly because of the proliferation of people wearing headphones and a reluctance to discuss sensitive information in front of a roomful of people. John Tocci, owner of Tocci Building Cos., decided to tear down the walls at his Woburn headquarters 20 years ago to create a more energized environment where young people can learn from experienced employees. When the company was building an open office for Biogen, the Cambridge biotech giant, the designers and contractors worked side by side, and one overheard conversation saved them at least a month of work. To mitigate this, the building company is in the process of redesigning its space to add glass partitions, acoustical panels, and phone booths. At Greentown Labs in Somerville, where employees of 48 clean-tech startups share an industrial space in a former envelope factory, Micaelah Morrill describes the atmosphere as a mix of “super awesome good juju and ‘Dude, shut up.’ ” Morrill, 33, a Greentown employee who helps connect companies to manufacturers, said people tend to leave if things get too hectic. “We basically keep three coffee shops in business,” she said. Six months ago, in response to requests from members, Greentown installed five curtained, sound-absorbing phone booths. Elizabeth von Goeler, director of interiors at the architecture firm Tsoi/Kobus & Associates in Cambridge, which is moving to a more open layout itself, said she spends a lot of time assuaging clients’ fears, explaining the benefits of combining open seating with private work areas and creating rules for when it’s OK to talk to a co-worker. “Sometimes I feel like my job is 50 percent therapy,” she said. And as more businesses are discovering, sometimes a bit of good old-fashioned cubicle-ness does the trick. Autodesk Inc., the 3-D design software company, recently moved to an open office in the Seaport District and installed 12 individual work stations surrounded by opaque panels on three sides — an in-demand new product from the furniture maker Steelcase called the Brody lounge. Mini-cubicles, in other words. And they have proved to be very popular.